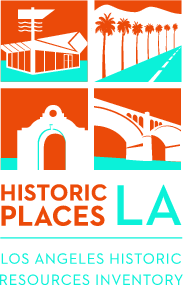 SurveyLA – the Los Angeles Historic Resources Survey – is Los Angeles’ first-ever comprehensive program to identify significant historic resources throughout our city. The survey marks a coming-of-age for Los Angeles’ historic preservation movement, and will serve as a centerpiece for the City’s first truly comprehensive preservation program. SurveyLA is a project of the City of Los Angeles Office of Historic Resources, with funding support from the J. Paul Getty Trust. For more information on the SurveyLA project, visit the official SurveyLA page at the Office of Historic Resources website. Although the City of Los Angeles Office of Historic Resources is responsible for the SurveyLA project, it also involves many other people. Within Office of Historic Resources, volunteers and interns play a vital role in the SurveyLA project. Historians and preservationists have helped to research and write the city-wide Historic Context Statement for the project, and both students and working professionals volunteer part-time or full-time in the Office of Historic Resources to help administer and support the Survey. The Office of Historic Resources has also contracted with various consultants and researchers in the field of historic resource management to conduct the actual fieldwork of the Survey. This blog, written primarily by SurveyLA volunteers and interns, is intended as an informal chronicle of the project. It serves as a companion to the official SurveyLA web site, providing a more intimate perspective on the process of the Survey as it unfolds, whether from our office at City Hall or out in the field with the survey teams. The blog aims to capture the flavor of the city, as SurveyLA discovers Los Angeles’ rich historic resources. As the survey progresses, this site will also provide a unique and broad-ranging view of the city’s built environment and heritage, and a day-to-day record of one of the most ambitious local historic preservation survey projects in the nation. The Survey is a multi-year project, multi-phase project. The first, preliminary phase was the pilot surveys, which have already been done. The pilot surveys covered Boyle Heights, portions of Pico Boulevard (between Crenshaw and the 110 Freeway) and Vermont Avenue (between Martin Luther King Blvd. and Manchester Blvd. ), and two sub-areas of the San Fernando Valley north of the 101 Freeway. The pilot survey work enabled the SurveyLA team to refine the project’s methodology, software and hardware, public participation strategies and consistency in decisionmaking before the survey work begins throughout the entire city. Palms-Mar Vista-Del Rey, West Los Angeles, San Pedro, Harbor Gateway, South Los Angeles, Southeast Los Angeles, Central City North, Sunland-Tujunga-Shadow Hills-Lakeview Terrace-East La Tuna Canyon, West Adams-Baldwin Hills-Leimert, San Pedro, and Hollywood. Sherman Oaks-Studio City-Toluca Lake-Cahuenga Pass, North Hollywood-Valley Village, Mission Hills-Panorama City-North Hills, Arleta-Pacoima, Canoga Park-West Hills-Winnetka-Woodland Hills, Encino-Tarzana, Brentwood-Pacific Palisades, Bel Air-Beverly Crest, Westchester-Playa del Rey, Westlake, and Silver Lake-Echo Park-Elysian Valley. Northeast Los Angeles, Venice, Westwood, Sun Valley-La Tuna Canyon, Van Nuys-North Sherman Oaks, Chatsworth-Porter Ranch, Northridge, Reseda-West Van Nuys, Granada Hills-Knollwood, Sylmar, Wilshire, LAX, and Industrial Properties in all Community Plan Areas. Regarding Allison Lyon’s artice, February 15, 2011, I was 8 years old when my parents bought a Steinkamp home, on Sherbourne Drive in Los Angeles. The homes were just being built and the Steinkamp homes were especially lovely; lots of wonderful touches such as tile roofs and the beautiful leaded glass windows in the living room and the breakfast room. The kitchen had lots of tile and a plant shelf above the sink. A large dining room made family get togethers especially nice. We had a fireplace in the livingroom but my parents only used it once; they didn’t want to smoke up the walls. The home was on a 50×150 foot lot and my father, a custom tailor, created a most beautiful back yard. He built a covered patio and the floor was concrete with inlaid bricks. There was a raised pond with a fountain. My father made the design molds for the exterior of the pond. Flower gardens and trees completed the lovely garden. I remember the full price of the home in December of 1940 was $5,750. At Preuss Road and Sawyer street the largest home in the tract was called “The House of the Magic Key”. It was a two story home with a pool and wonderful view of the city. And the list price ws $12,500, a lot of money at that time. We loved the home on Sherbourne Drive and my parents lived there until the early 1980s.